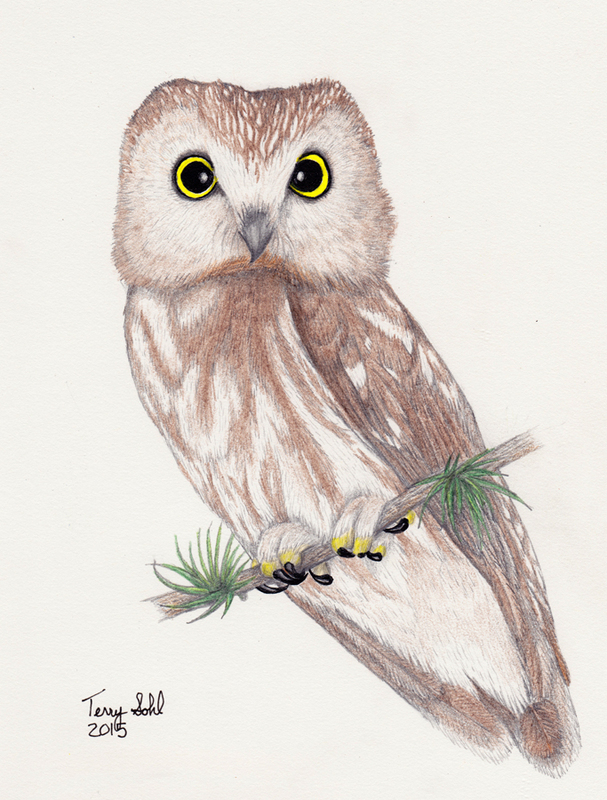 A colored pencil of drawing of a Northern Saw-whet Owl. 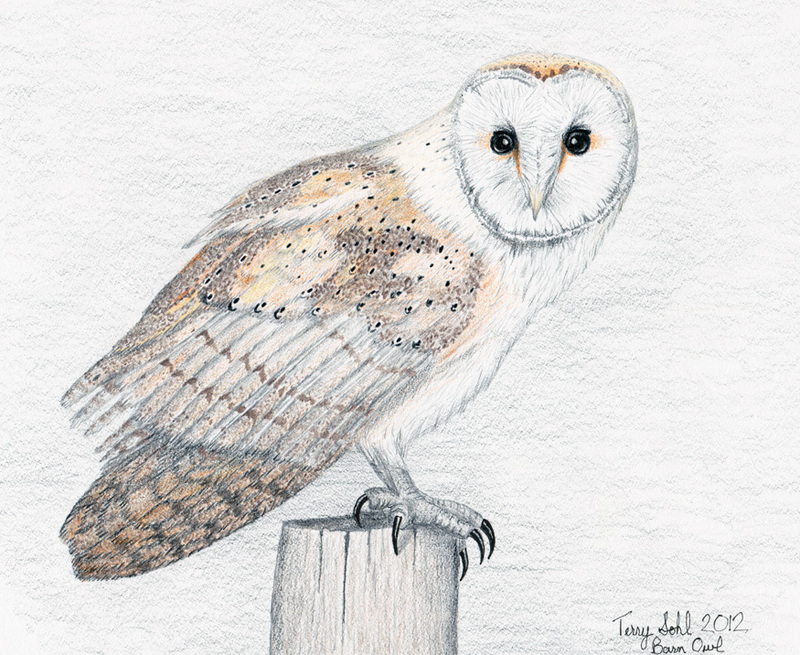 I couldn’t wait until they arrived for the winter, so in the meantime sat down and drew one. Last winter was a blast. OK, that’s not something you typically say when you live in frigid South Dakota, but I really enjoyed last winter, and am looking forward to the cold weather again. The reason? Northern Saw-whet Owls!! Prior to last winter, I’d seen them on rare occasion, when I went to the Pierre area. 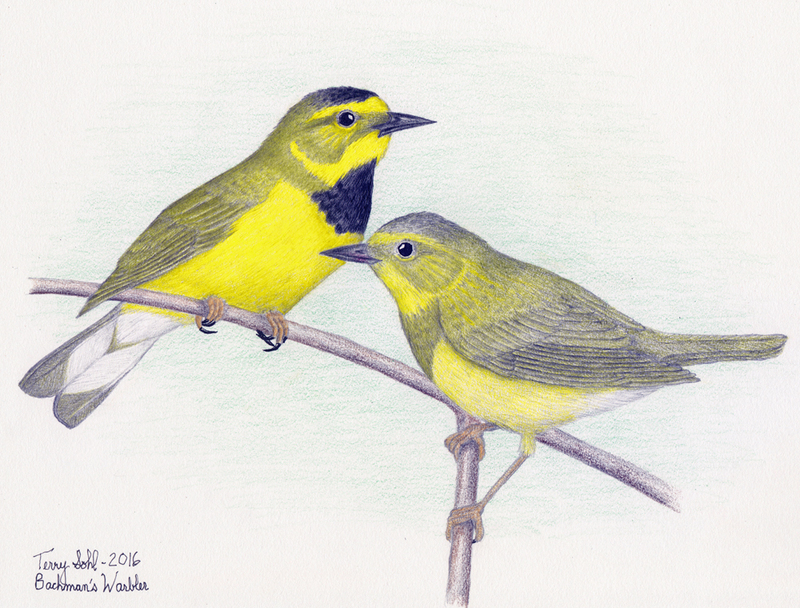 It was a quite a few years ago when birders in the area started looking for them in cedar tree thickets near the Missouri River. It takes quite a bit of work to find one however. Looking for Saw-whet owls typically involves bush-whacking through dense cedar thickets, looking on the ground and on tree branches for the tell-tale “white-wash” that accumulates when the little owls use the same roost day after day. 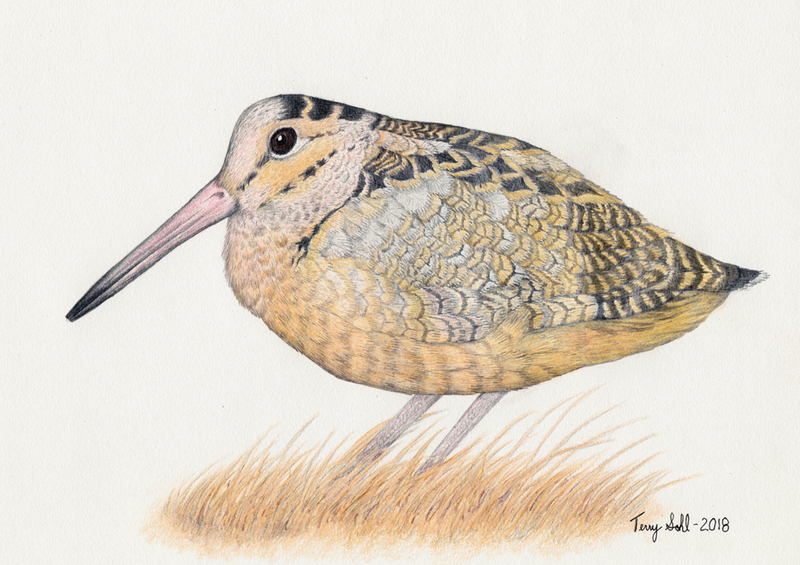 When I say I’d seen them on “rare occasion”, it was literally ALWAYS finding a bird that someone else had found. Oh sure, I’d given it the ol’ college try. Prior to last winter, there were a number of times that I myself would go tromping through cedar thickets in Pierre, trying to find the little owls. I was great at finding roosts where they USED to be! As for finding a live owl? Not so much. I think people always suspected Northern Saw-whet Owls were much more widely distributed in South Dakota in the winter, but actual reports were few, likely due tot he effort involved in actually finding one. Last winter I was determined to 1) actually find my “own” Saw-whet owl, and 2) do so right here near Sioux Falls, rather than making the 3 1/2 hour drive to Pierre, where they’re known to be found. It wasn’t very encouraging at first. And when I say “at first”, I mean there were probably about 10 fruitless trips trudging through cedar tree thickets, looking for owls. The story was much like my attempts in Pierre…I was GREAT at finding owl pellets and whitewash, but wasn’t finding the owls themselves. That all changed in January when I finally found my first Northern Saw-whet Owl in southeastern South Dakota. It was at Newton Hills State Park, and he wasn’t alone! On that truly magnificent day, I found not one, but four different Saw-whet Owls, all in the typical cedar thicket habitat that was similar to where they had been found for years in Pierre. At least according to “eBird” reports, these were the first Saw-whet Owls reported in this part of the state. The rest of the winter was great, going back to visit previously found Saw-whets (they tend to have roosting site fidelity, using the same sites for many days in a row), and finding new ones. I ended up finding a few more at Newton Hills that winter, and then also started finding them around Lake Alvin, just south of Sioux Falls. For the winter, at least 9 individual over-wintering owls were found. Just in the past few days bird banders in the area reported capturing and banding the first migrating Saw-whet owls of the season. They’re here! Or, at least they’re starting to arrive! I’ll probably wait a couple of weeks before heading out to actually look for one, giving them a little more time to arrive, giving a little more time for the whitewash and pellet evidence to accumulate. 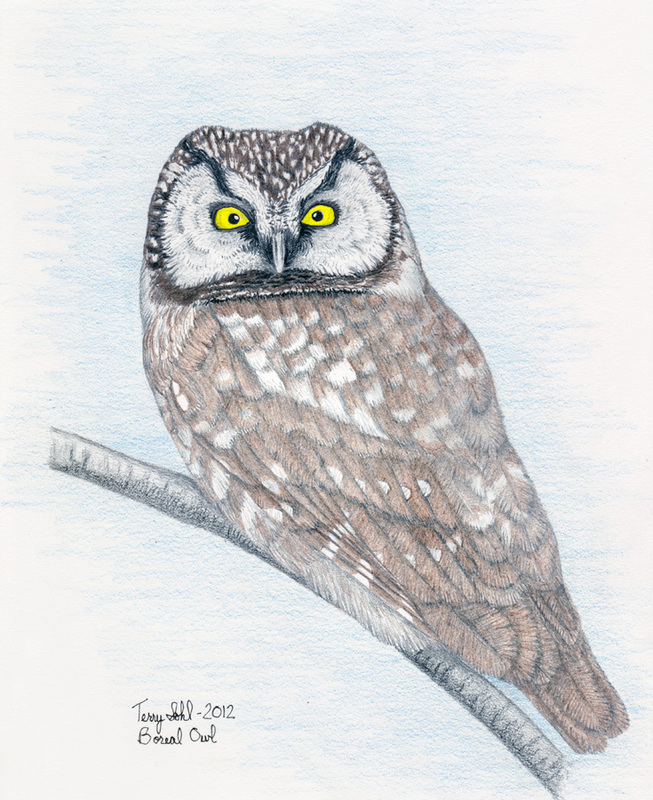 In the meantime, last weekend in my excitement for the coming winter, I did a colored pencil drawing of a Northern Saw-whet Owl, using a photo of one from last winter as a guide. 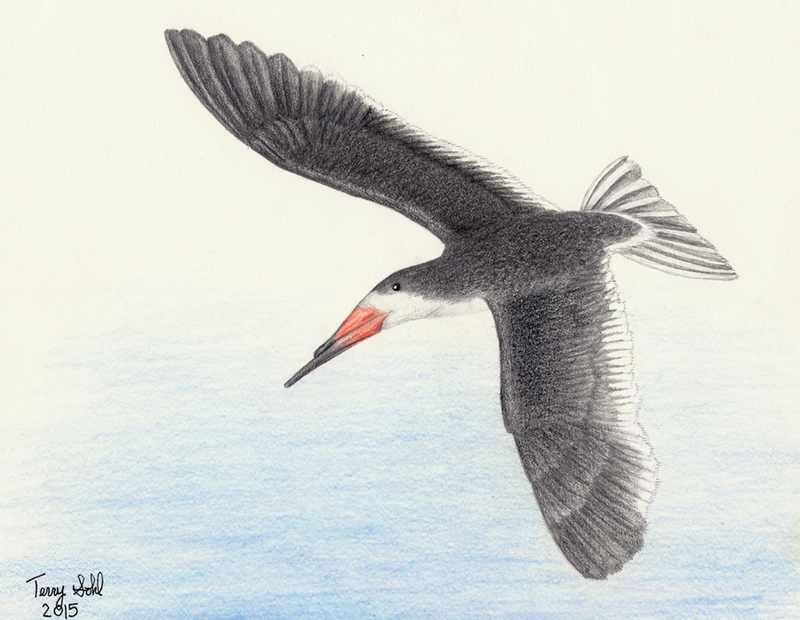 Colored pencil drawing of a Black Skimmer – Rynchops niger. June of 2 years ago. That’s the last time I’ve touched a pencil. June 8th, to be exact. I started a drawing of a Black Skimmer, a species I’d only seen a few times, and had never gotten a good photo of. 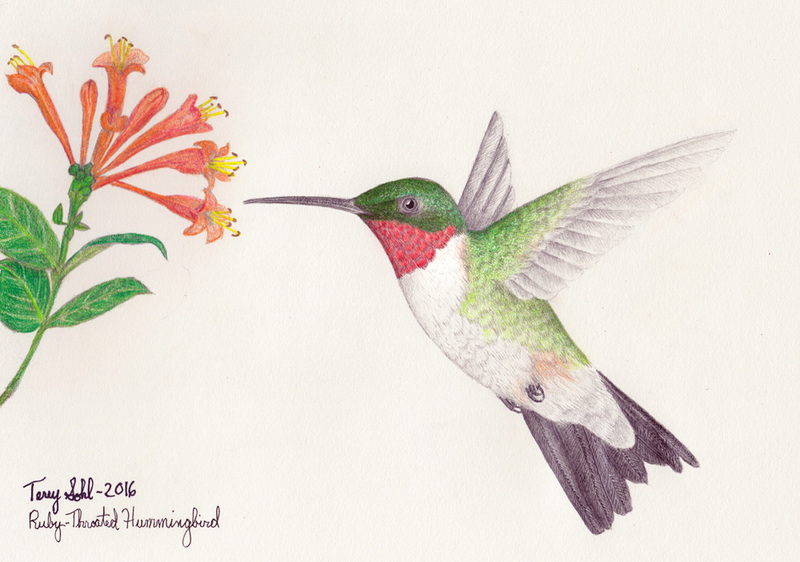 I thought I’d do a quick and dirty drawing for my website, so I started that evening. I got about halfway done before deciding to finish in the morning. It was that next morning that I woke up feeling very achy, joints hurting, with my eyes stuck shut from being so dry. Just like that, overnight, I was introduced to the wonderful world of Sjogren’s Syndrome. 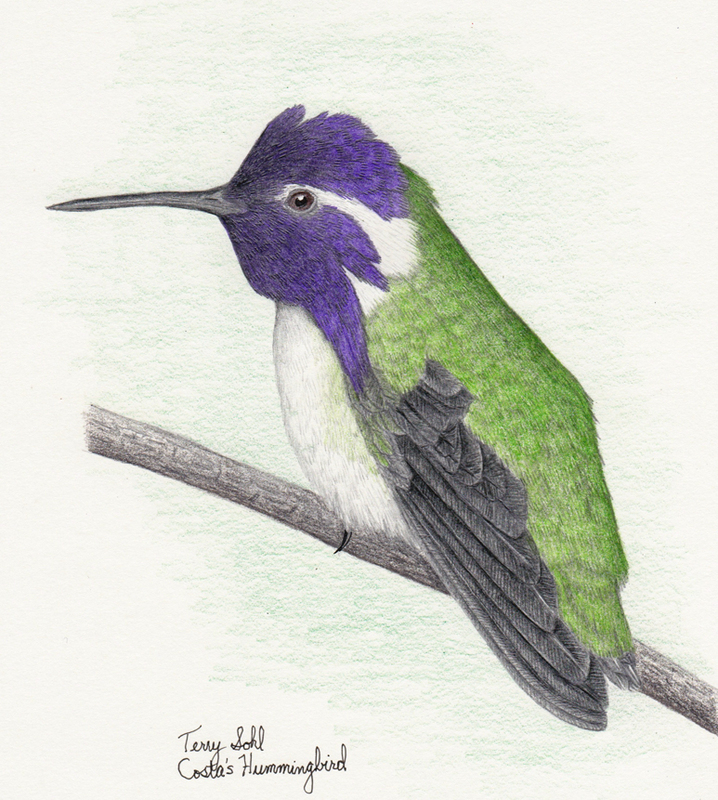 All of my drawing equipment and my half-finished Black Skimmer drawing were put away in a drawer. And there they lay forgotten for the next 2 years, 3 months, and 18 days. No, “forgotten” isn’t the right word. I occasionally remembered the drawing. 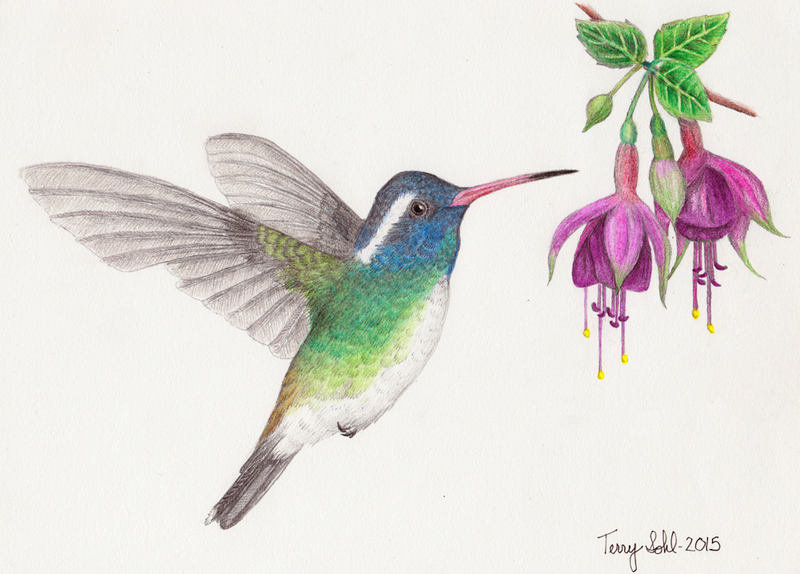 I occasionally thought about picking up a pencil and starting to draw again. But I couldn’t bring myself to do so. Drawing, and this Black Skimmer image, were associated in my mind with the onset of Sjogren’s. Every time I thought about starting to draw again, it brought me back to June 8th, 2013, and all the “fun” physical symptoms I’ve had since. And thus the pencils sat for over 2 years. 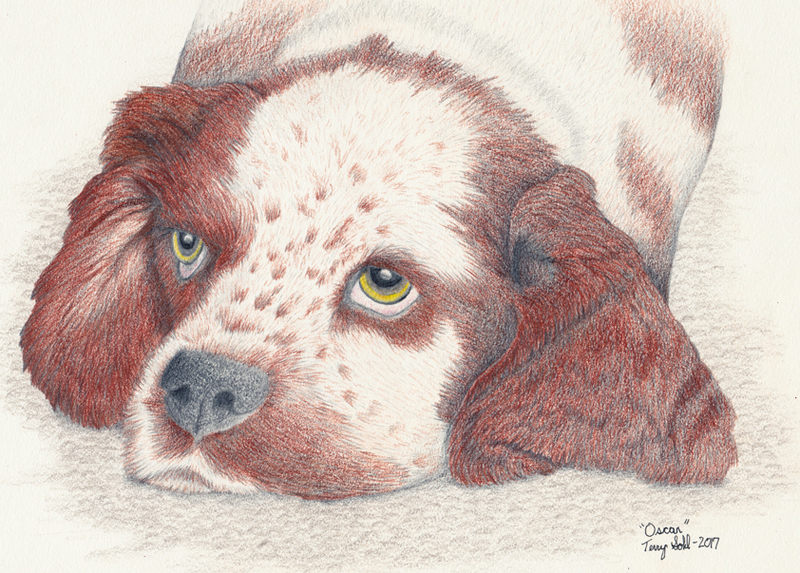 This past weekend I picked them up again, and finished the drawing. My biggest issue right now are my eyes. Very dry, gets worse as the day goes on, which makes it hard sometimes for me to even want to keep them open, and also makes things blurrier and blurrier as the day progresses. Not ideal for drawing, with either blurry eyes or closed eyes. I think my drawing strategy will usually have to be doing it in the morning, or up to mid-afternoon at the latest, before my eyes start to get really bad for the day. 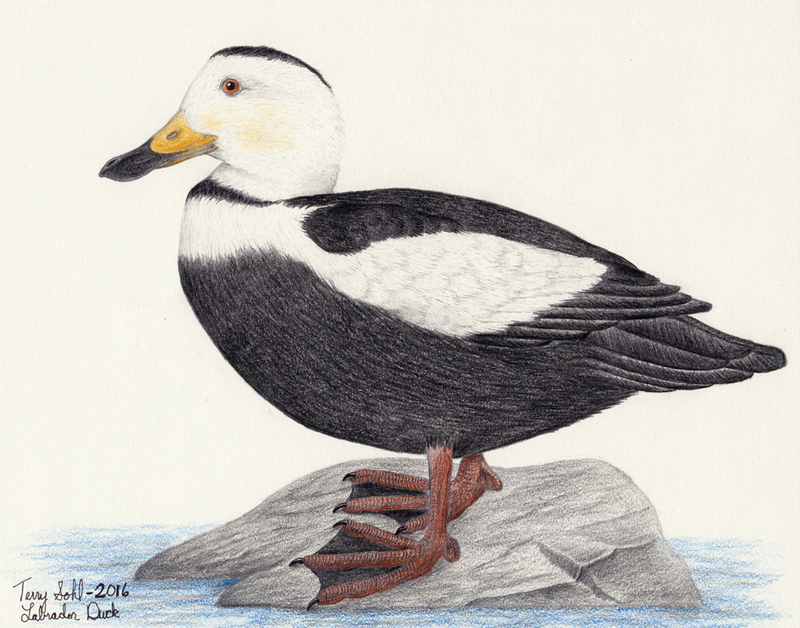 In any event, the pencils have been taken out of storage, the Black Skimmer has been completed (as has another drawing, which I’ll post later).